You work endlessly to make your house feel like a home– one that’s functional, comfortable and a natural expression of your personality. And that feeling doesn’t stop at your door. From a lush lawn and colorful garden to a welcoming patio and inviting entryway, your landscape and outdoor living areas are essential parts of your home, too. Think, then, of a fence as the “picture frame” for your property. Fences should exemplify those ideas of form, function and individuality. They should show off your personal style, offer a sense of security and enhance your curb appeal. At Castle Point Landscape Design, we sell and install a wide variety of fencing, including vinyl, wood and aluminum, to define your property and capture its beauty. Security. Fencing creates a safe and contained outdoor environment. Fencing not only keeps your pets safe inside your yard, but it will keep large animals and uninvited guests from entering, too. Plus, it is especially important if you have or plan on installing a pool. Privacy. Especially in an area with neighbors close by, fencing will help your property to remain hidden from prying eyes and will create a feeling of seclusion. Fencing will also offer a clear indication of where your property ends and neighboring properties begin. Aesthetics. A high-quality, well-crafted fence can be an asset to your landscape’s appearance. Many people choose to have a fence installed simply because a well-constructed and designed fence adds character and beauty to their property. 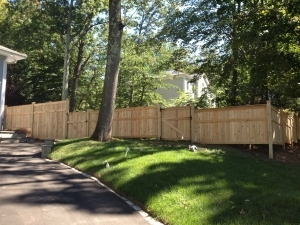 Not only can fencing increase property value, but it also enhances curb appeal. Style. With a wide range of styles and materials available, homeowners and businesses can easily find a fencing option that suits their needs and their preferences. This also enables you to stick to a budget, as there are a range of prices. At Castle Point Landscape Design, we sell and install a wide variety of fences, including vinyl, wood, aluminum and chain link. No matter your needs, we provide accurate estimates and prompt, courteous service. We work with you, from start to finish, to ensure that we supply you with the right fencing for your project requirements. Whether you’re looking for fencing for the safety of your property, pool, children, or pets; or you need to enhance your security and privacy, our experts can help. Our attention to detail in both the evaluation of your physical location, along with consideration of your personal ideas and custom requirements, is what sets us apart from the rest of the pack. Check out some of our work and discover the possibilities for your landscape. Take the Next Step Contact us today for a free quote.